The stylish Bakone Malapa Museum is a wonderful place to experience the rich culture of the BaSotho people. The Bakone, a highly sophisticated subgroup of the Northern Sotho tribe, will give you a warm welcome and enthusiastically share their contemporary and traditional customs. The guides are superb story tellers and the village becomes alive as they take you on a journey through their traditional way of life. Considered a living museum, the Bakone tribesmen practise long-standing traditions to explain the traditions of Africa’s people. Another reconstructed village like it is the open-air Tsonga Museum near Tzaneen. 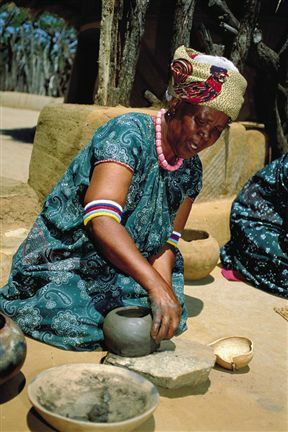 Bakone Malapa is built in the style used by the northern Sotho 250 years ago and demonstrates the daily life of the Bakone clan. 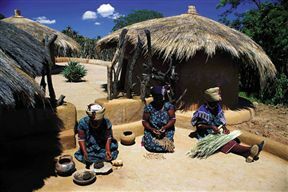 Two homesteads exhibit and explain fire making, maize grinding and beer brewing in the traditional manner. Handcraft demonstrations include pottery, basketry and bead work. Most of these locally-made creations are sold from the onsite craft shop. And that’s not all – the museum and cultural village has a bird sanctuary, wildlife reserve, hiking trails and outdoor recreation areas. The Bakone Malapa Museum is 9 km from Polokwane on the R37 (Burgersfort Road) and is easily accessible by road. Bakone Malapa Museum is 7.7km from the centre of Polokwane (Pietersburg) , the nearest airport 13.1km (Polokwane Airport).